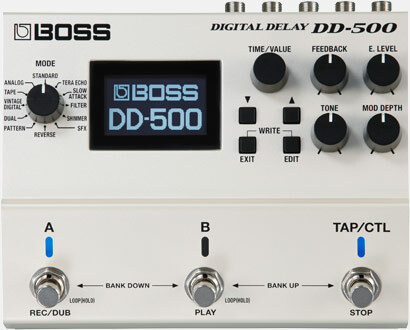 • Analogâ€”Emulates classic analog “BBD” delays like the BOSS DM series. • Tapeâ€”Emulates the warm sound of tape-based delay units, including the Maestro Echoplex and legendary Roland RE-201 Space Echo. • Vintage Digitalâ€”Emulations of early digital delays from the 1980s, including Roland’s famous SDE-2000 and SDE-3000 rack units and the BOSS DD-2, the original stompbox digital delay. • Dualâ€”Two different delay lines that can be connected in series or parallel. • Patternâ€”Sixteen different delay lines that can be set independently for all types of unique rhythmic effects. • Reverseâ€”Backwards delay for cool psychedelic effects and other unique tones. • SFXâ€”“Special effects” delay with a highly unique sound character. • Shimmerâ€”Pitch-shifted delays for lush, heavenly textures. • Filterâ€”Delay with a sweeping filter. 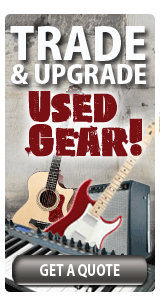 • Slow Attackâ€”Ethereal delays that fade in with playing dynamics. • Tera Echoâ€”Spacious, animated ambience effect derived from the innovative BOSS TE-2 pedal. • Tapâ€”Set the delay in time with a song’s tempo. • Holdâ€”The delay’s feedback is held continuously while the switch is pressed. • Warpâ€”Increases the delay’s feedback and level simultaneously for powerful expressive effects. • Twistâ€”Adjusts multiple delay parameters with a single press, creating wild sounds similar to twisting the panel knobs in real time. • Momentâ€”Outputs the delay sound only when you hold down the switch. • Roll 1/2â€”Cuts the delay time to 1/2 of the current setting when you hold down the switch. • Roll 1/4â€”Cuts the delay time to 1/4 of the current setting when you hold down the switch. • Roll 1/8â€”Cuts the delay time to 1/8 of the current setting when you hold down the switch. • Fade Inâ€”Fades in the delay sound. • Fade Outâ€”Fades out the delay sound. • Assign 1-8â€”Allows you to assign and control up to eight different delay parameters at once. A compact, versatile delay with 12 modes.